The goal of this web site is to educate others in the exciting world of dinosaurs and to provide the best fossils available for rent, purchase, or show at schools, museums, and other educational institutions. I am available for showing fossils and can provide shows with speaking engagements to help contribute to education. 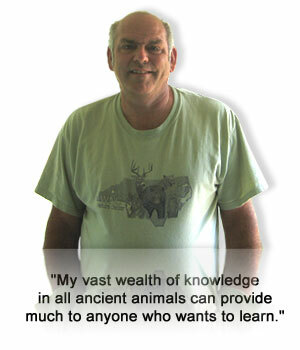 My vast wealth of knowledge in all ancient animals can provide much to anyone who wants to learn. My overwhelming desire for detail and my vast collection of specimens can educate the public on this world that has all but been forgotten. Anyone who wants to seek knowledge on the subject can contact me at 706.235.2694 to discuss these animals at length. I will provide the utmost professionalism and help anyone desiring to learn more about this fascinating subject.